The food label can be, well, boring, and it can also be very confusing. I don’t know anyone who has the time to read the fine print and scour the Nutrition Facts panel for everything he or she is dropping into the shopping cart. A recent study looked at how many Americans use the food label and which parts of the food label. 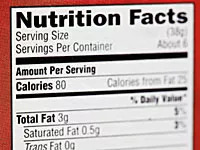 The study found that approximately 62% reported using the Nutrition Facts panel, 52% looked at ingredients, 47% looked at serving size, and 44% read the label’s health claims before purchasing. When the researchers compared label users to nonusers they found—unsurprisingly—that the diets of label readers were lower in total calories, fat, saturated fat, sodium, and added sugars. In order to have a healthy diet, it’s essential to have healthy foods on hand, and the only way to really make sure of that is to read the food label for some key facts before buying. I’d recommend focusing on the serving size and calories if you’re going to look at just two things before buying. And, even as a dietitian, I have to marvel at the ingenious ways food manufacturers take advantage of the food label to make products appear healthier than they often are. Here are five ways shoppers are destroying their diet, despite their best efforts to use the food label to make healthier choices. The USDA organic certification program requires foods and beverages that are labeled organic to follow organic protocols with production. The program does not have any requirements related to the nutrition of the product. The term “natural” or “all natural” has no definition, so manufacturers can use it as they wish. There is no indication that a food product is nutritious just because these terms are on the package. Check the calories per serving and the first three ingredients. If the product seems within your calorie budget and the first three ingredients seem healthful, then buy it. Many shoppers scrutinize the % Daily Value figures for things like vitamin C and E, but nutrient deficiencies are not an issue for most Americans. Instead, focus your attention on core areas that can really make a difference in your health: negative nutrients. Read the label for calories, saturated fat, sugars, and sodium and try to choose products that minimize these negative nutrients. 3. That’s a single serving!! If you purchase a food that appears to be a single serving, be sure to check the Nutrition Facts Label to see how many servings the manufacturer says the package contains. People in the study who reviewed the product’s serving size before purchasing consumed 150 fewer calories per day compared to those who didn’t read the labels. That could add up to a 15-pound weight loss in one year. Not the case. Many companies claim that their products are made with whole grains, but the main grain is often refined flour. To ensure that you’re buying a product that contains a significant amount of whole grain, choose one that has whole wheat, oats, or another whole grain as the first ingredient. A sweet mess many shoppers find themselves in is when they avoid products that have HFCS, only to choose those loaded with other negative nutrients like saturated fat, sodium, and added sugars. The jury is still out on whether or not HFCS is worse than other added sugars, but a diet rich in any type of added sugar is not healthy. So look for the added sugar in a product, and if it’s more than 10 to 12 grams per serving, make it a special-occasion food or beverage. To get more tips, read 11 Ways to Pick Out Healthy Food. Previous articleIs Black Rice the New Brown?